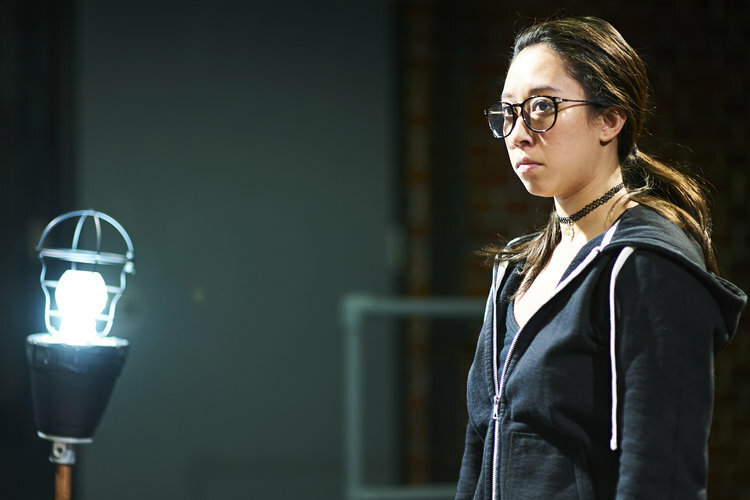 Ike Holter’s Red Rex takes a deep dive into the underbelly of making theatre in Chicago, and a brave ensemble of people at Steep Theatre rose to the challenge. The sixth play in the Rightlynd Saga directed by Jonathan Berry gets its name from the fictional theatre company at the center of the narrative, Red Rex Theatre Company. After almost a decade of relatively mediocre production Red Rex has recently taken up residence in the abandoned former home of the Three Lord Gang – one of many easter eggs from the rest of the Rightlynd Universe (the RU, you know, like MCU). At top of show, Nicole (Jessica Dean Turner), explodes onto the scene with an impressive monologue that moves the director Lana (Amanda Powell) to cast her in a new play about an interracial love affair as the sole actress of color. Powell and Turner have some of the most difficult language in the play, including a theatre game that involves repeating questions to get at the heart of a rehearsal conflict. Red Rex uses language as elevated and accessible as the L train it premiered beneath. Forgoing fancy vernacular, Holter taps into an old school facet of playwriting that is currently underutilized: he gives you language and defines it, rather than expecting you to understand an existing concept before entering the room. In this play we are given the gift of the word “poorfront” a storefront theatre that is, for lack of a better term, busted. There is an effortless simplicity in Holter’s writing that mirrors how a human being really talks, yet it is for this reason that it presents an enormous challenge to the actors, and they do not disappoint. Aurora Adachi-Winter plays Tori, the dutiful and deadpan stage manager who just wants to do her job. Tori is frustrated by the lack of care shown for the creative impulses of their Jeff award winning set designer Max (Nate Faust), as well as for the actors in the show. In a truly touching scene towards the end of the play, we get a sense of who they could have been had they not chosen this incredibly difficult career path. Adachi-Winter lends a comic sensibility and noble ferocity to Tori, while Faust is lovably gruff and heart wrenchingly jaded as Max. Red Rex does not shy away from the complexities of making theatre on a budget, at one point Max offers to fund his own set with money from another gig. Greg (Chris Chmelik), the Executive Director who is constantly berated for being heartless and financially secure, also invests three thousand dollars of his own money into making the show happen. This is an all too common practice, where artists are paying out of pocket for things that should be covered by the institution, just to ensure the art is something of which they can be proud. Director Jonathan Berry comments in his program note on the complexity of producing a play intended to criticize (albeit lovingly and constructively) our local theatre scene, while being a member of that community. Berry’s aesthetic varies greatly, his last show for Steep, Birdland, was incredibly decadent. The set design for Red Rex (Joe Schermoly) is relatively bare to reinforce the “poorfront” that is Red Rex Theatre Company, but there is a particularly decadent set piece that is revealed halfway through the show. Berry finds ways to keep the world lush by collaborating with designers to fill the space with light (design by Pete Dully), and with multitudes of creative staging. Stefani Azores-Gococo’s costume design places us squarely in January in Chicago, and each character had an archetype of dress, Lana’s super airy director-y layers and Max’s purple rabbit foot come to mind. The design elements are polished off by creative projections, and a bumpin’ sound design by Sarah D. Espinoza that drives the heartbeat of the show. Steep and its ensemble must be commended for their bravery in venturing into this self-examination, company member Joel Reitsma’s character Adam has a joke about being cast in the show solely because he is a company member. Nobody can attest that for Reitsma in Red Rex, his explosive portrayal of Adam drives the play to its critical point as he makes the audience fear for the safety of everyone around him. Lana and Greg, the Artistic Director and Executive Director of the fictional company respectively, are villains in their own ways. Greg has never even met anyone in the neighborhood despite working in housing and redevelopment (read: gentrification) which Max thinks is because he’s uncomfortable around people of color. Chmelik’s portrayal of Greg is somehow simultaneously clueless about interacting with people of color, yet alarmingly intelligent when it comes to their exploitation. What is specific about their characters is they are each cis gay white people. This is a particularly nuanced move by Holter, as frequently in the theatre scene cis queer folks will compare their marginalization to people of color and other groups, and take up spaces that do not belong to them as a result. Quite literally, the space they are taking up is the abandoned storefront in Rightlynd, problematic because their target audience are rich north side theatre patrons. Red Rex had a lot of expectations and energy behind it, as it was following the premiere of the extravaganza that was Rightlynd at Victory Gardens Theater. It certainly lives up to the hype and then some. Once the play locks into the real conflict that centers Debo Balogun as Trevor, the train is on the track and you do not want to get off this thrill ride. Balogun, previously seen in Moon Man Walk at Definition Theatre, gives an intense, heartfelt, and occasionally sinister performance as the only other resident of Rightlynd besides Nicole. Red Rex is an extraordinary achievement and worthy addition to the Rightlynd Saga. It is the sixth play in the saga, and we will finally see the conclusion in Lottery Day upcoming at the Goodman Theatre. Holter has written a searing satire of Chicago Theatre that both practitioners and theatre novices will comprehend as each member of the company passionately advocates for the importance of what they do. If you have never seen a play in your life, see Red Rex at Steep Theatre.